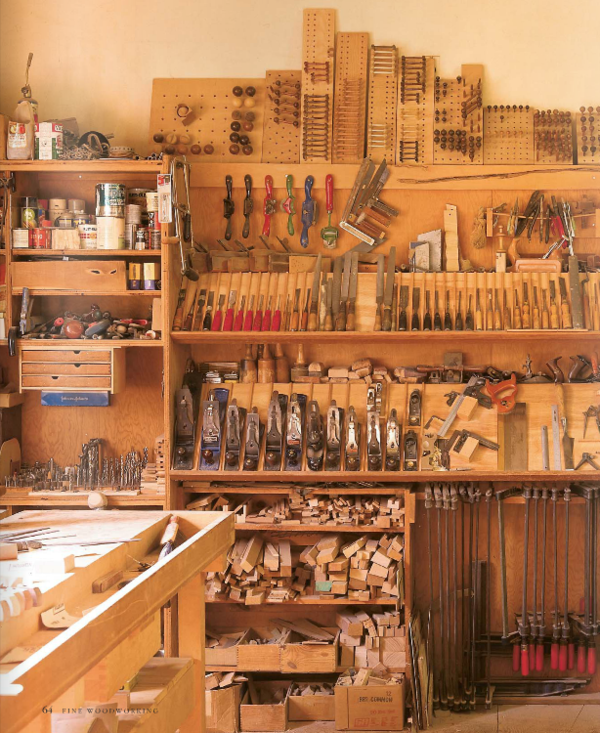 This is the tool wall in the workshop of Rhode Island furniture maker Hank Gilpin. It places every hand tool used in the shop - including saws, clamps, scrapers, drill bits, chisels, planes, and measuring tools - within an arm's reach of the shops two main benches. Hank says, "The wall's layout is simple and practical. Each of the primary tools...has a spot to sit in and can be taken out without moving anything else. Blade's stay sharp, squares stay true, and saws stay true. The slanted shelves for the planes and chisels make the tools easy to locate and grab. A strip of wood tacked along the lower edge of these shelves keeps the tools from sliding off, and 5/16-in.-sq strips between the tools keeps them spaced properly." That's it. No fancy how-to... just some seriously droolworthy workshop inspiration for your Wednesday. See the full article from the June 1998 issue of Fine Woodworking. For real. I have massive workshop envy now.